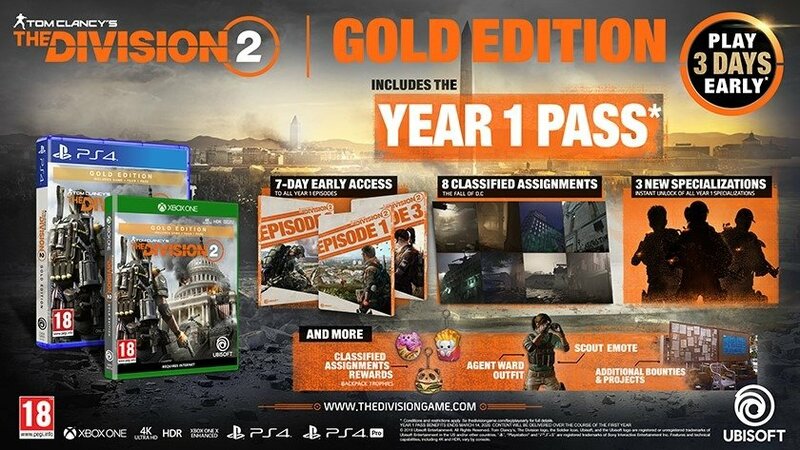 Play three days early: Pre-order the GOLD EDITION of Tom Clancy’s The Division® 2 and get your copy as soon as March 12th, 2019.
o The Tom Clancy’s – The Division® 2 Game with exclusive Key art. o The Year 1 Pass that includes a 7-day Early Access to all Year 1 Episodes, exclusive customization items, additional activities and more to be shared soon. 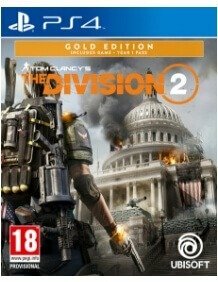 Developed by Ubisoft Massive, and the same teams that brought you Tom Clancy’s The Division®, Tom Clancy’s The Division® 2 is an online open world, action shooter RPG experience set in a collapsing and fractured Washington, D.C.. This rich new setting combines a wide variety of beautiful, iconic, and realistic environments where the player will experience the series’ trademark for authenticity in world building, rich RPG systems, and fast-paced action like never before. Play solo or co-op with a team of up to four players to complete a wide range of activities, from the main campaign and adversarial PvP matches to the Dark Zone – where anything can happen.